At the end of 1925, the second prototype D 12 single-seat fighter was re-engined with a 500hp Hispano- Suiza 12Gb (HS 50) 12-cylinder W-type water-cooled engine and redesignated D 21. The D 21 had the four 7.5-mm (0.295-in) Darne machine-guns. Intended for export, the D 21 was first demonstrated in January 1926 at Bruxelles-Evere, the first export order from Turkey, for two D 21s for evaluation. Czechoslovakia ordered three and Argentina 18, plus the prototype. 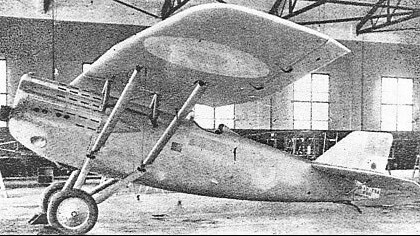 Of these, the three Czech aircraft and seven of the Argentine aircraft were assembled by the EKW in Switzerland. A manufacturing licence was obtained by Czechoslovakia, Skoda building 26 D 21s during 1928-29 (as Skoda D 1s) with Skoda L engines (derived from the HS 12G) of 562hp. Out dated by the late 20s, they were discharged by the Czechoslovak Army and used by the Police Air Patrol. Argentina also procured a manufacturing licence and the Fabrica Militar de Aviones (FMA) built 58 examples during 1930-31, but with Madsen machine guns and the licence-built Lorraine-Dietrich 12Eb W-type engine. They became effectively D 12s, although the designation D 21 was retained. One French-built D 21 was sold to Switzer-land, where in late-1926 Emile Dewoitine had taken up residence, his French company having been bankrupted by the lack of domestic orders for any type since the D 1, and where, in 1928, there appeared the final development of the D 1 formula, the D 27. In the autumn of 1927, Turkey placed a follow-on order for 10 D 21s, these being delivered during 1928-29.